Is there anything as dark, desolate and depressing as a summer resort in the off-season? That’s what I was thinking as I walked north on Ocean Boulevard, past the boarded up fried dough stands, T-shirt shops and cheap jewelry stores. In the moonlight I could see all the way to the Casino, not another soul out. Hard to believe in a few months you’d have to fight your way through the crowds on these cold, barren sidewalks. It didn’t take long before I reached the street I wanted. The house itself was halfway down. It was a mess. One of the worst on the beach. A dump. Carefully I walked up onto the porch. It wasn’t safe. The wooden door was unlocked. I went inside. The sweet smell of chemicals being drained thorough human bodies hit my nostrils. Mixed with body odor, it was a sickening aroma. Like cheap toilet water. I had smelled it before. When my eyes adjusted to the semi-darkness, I could see people moving about. If that’s what you could call them. More like eerie shadows. Night of the Living Dead. Some moved towards me. Unlike zombies, when I parted my leather coat and exposed the double-barreled shotgun, they floated backwards. I walked through the living room. More like a dead room. Dead food, dead beer bottles, dead eyes. None of the dead faces were familiar. I stepped on empty vials that crunched like gravel under my shoes. Then crushed something larger but thinner. A pipe? Someone gasped. Someone else whimpered. I walked to a narrow hallway. The smell was like a gas station’s restroom. I moved along the corridor. A door was ajar to my right. Pushed it open with the shotgun. I could see the entire room. Four or five sets of eyes lasered in on me. Some from the floor, some the bed. None were the ones I was looking for. I moved farther down the hallway to the next door. It was closed. I opened it and stepped inside. I saw her instantly. Lying on the bed. She was looking at me but I saw no recognition in her eyes. Someone was beside her. Had I seen him before? I didn’t know or care. I went to the bed. She must have realized it was me then because she sank deeper into the bed. “Don’t worry,” I said. “I’m not here for you this time.” With those words she seemed to rise up as if the mattress was filling with air. I ignored her, glanced around. Then I saw what I had come for. I reached down beside the bed with my free hand, grabbed the child under her arms. Lifted her off the floor. She didn’t weigh anymore than the shotgun. Pulled her close to me. The only sound was her breathing. I left the room, retraced my steps along the hallway. As I walked back through the living room, a dozen eyes followed me. I wondered what they thought? No one did or said a thing. Maybe this time it wasn’t just the shotgun in one hand that kept them still and silent. Something decent left deep inside? Maybe. On the other side of the room, I opened the door and stepped through it. I was outside now. I walked carefully down the porch steps to the sidewalk. I could smell the salty sea air. It must’ve been high tide. I turned and looked at the building I’d just left. I knew I would never see it again. And even my granddaughter, who I held tightly to me, couldn’t fill the emptiness in my chest. 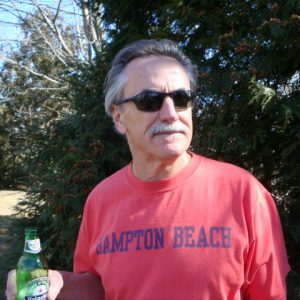 Jed Power is a Hampton Beach, NH based writer and an “Active” member of Mystery Writers of America. His third novel in the Dan Marlowe crime series, “Blood On Hampton Beach,” is now out in both e-versions and trade paper. The first novel in the series, “The Boss of Hampton Beach,” is also available in both paper and e-versions, as is the second book in the series, “Hampton Beach Homicide.” The protagonist is Hampton Beach, NH bartender, Dan Marlowe. The real Dan Marlowe was Jed’s father’s best friend. Mr. Marlowe wrote his crime masterpiece, “The Name of the Game is Death,” while living with the Power family in Woburn, MA. He named a character in the novel after Jed Power. Jed has returned the honor by naming his protagonist Dan Marlowe. Jed also collects vintage Noir/Hardboiled paperbacks, which includes, amongst many other items, the largest collection of Dan Marlowe novels, short stories, inscribed items and memorabilia. Jed is also mentioned several times in the new Dan Marlowe biography, “Gunshots In Another Room,” by journalist Charles Kelly. 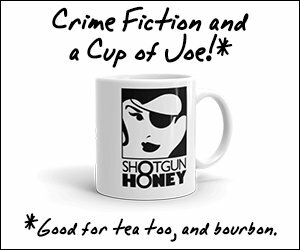 He has been published in “Spinetingler,” “Over My Dead Body,” “Hardboiled,” “Boys’ Life,” “Plan B,” “Stone Cold--Best New England Crime Stories Anthology,” “The Rap Sheet,” “Yellow Mama,” “Short Story Digest,” “Near to the Knuckle,” “Naked Kiss,” “Short-Story.me,” “Twist of Noir,” and others.